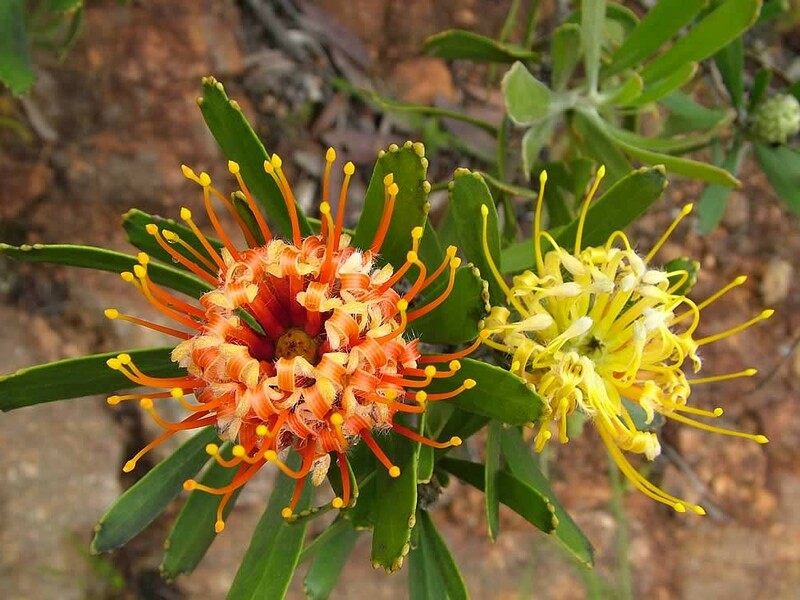 Five major vegetation types have been recognised in the BWA. These vegetation types all meet in an extremely broken topography, where several different soil types are exposed adjacent to each other and where numerous gorges, ravines and exposed areas create different micro-climates across an area with high variability in seasonality and the amount of rainfall. These different habitats all support different vegetation types, which often occur in close proximity to each other and often intermingled to a greater or lesser extent. Very little botanical work has been done in the area. Despite this, more than 1100 plant species are known to occur here and undescribed species are continually being discovered. Rare and endangered species total 32, and 26 species are regarded as endemic to the reserve (i.e. not occurring anywhere else in the world). Forest patches can be found in most of the deep gorges that are so characteristic of the area. These gorges provide the ideal micro habitat (cool, moist and sheltered from fire) for these forest patches which are in fact relicts of a bygone era when climates were wetter than present and forests covered much of the southern continent. Common trees include the yellow woods Podocarpus falcatus, Podocarpus 1atifolius, Cape fig Ficus sur, white stinkwood Celtis africana, Nuxia floribunda, milkwood Sideroxylon inerme and rooiels Cunonia capensis. Many of the reserve's 32 fern species can be found in these forest patches. Accessible patches can be found in the Poortjies, Geelhoutboskloof and Drinkwaterskloof. Two types exist viz. Valley Bushveld and Spekboomveld, however they can be difficult to differentiate between. 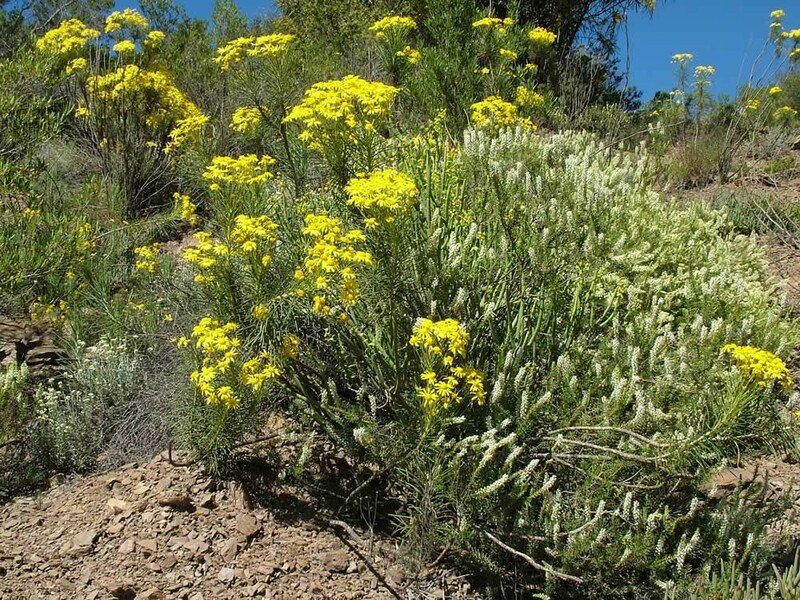 Generally this veld type occurs on the valley slopes and is characteristically very dense, 2-4m high vegetation, with an abundance of spiny and succulent species. Although the spekboom Portulacaria afra occurs in both types it dominates the Spekboomveld. 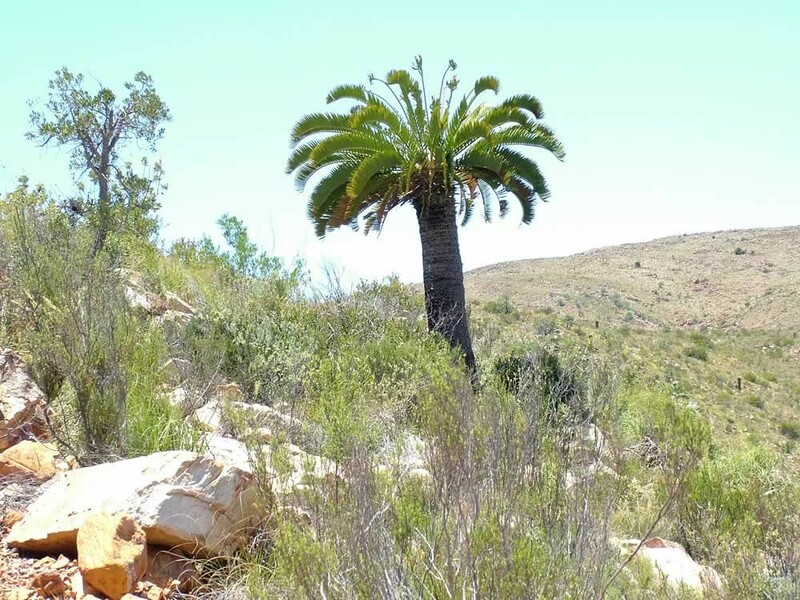 Other characteristic species include the "boerboons" Scotia qfra and Scotia latifolia, "wildepruim" Pappea capensis, Plumbago auriculata, and the tall cactus-like Euphorbia grandidens. 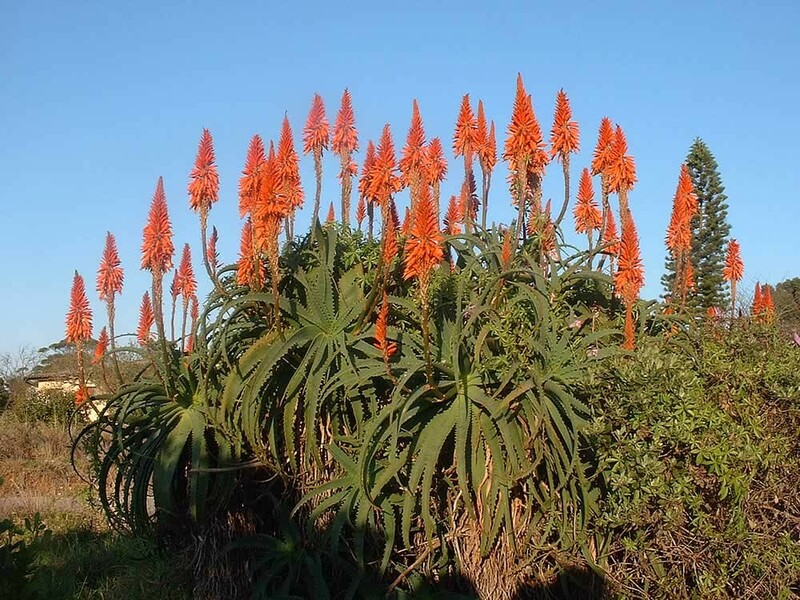 On the cooler southern slopes Aloe speciosa with its drooping leaves can be often seen in fairly large numbers, while on the hot, dry northern slopes the "kerkei" Crassula ovata, a squat succulent reaching a height of 1-1,5m occurs commonly. Sub-tropical thicket is a very palatable and nutritious veld type and as a result, where it occurs (or in close proximity) is where the visitor is likely to see the most game. It appears to be unique in that it is the only veld type known in the world to be driven by the action of large herbivores. In other words, in order to survive in a healthy state it needs to be browsed. As a whole, this veld type has been decimated by goat farming and herein lies the paradox. Goats feed from the bottom up and in so doing prevent the spekboom from reproducing vegetatively. The dense, more or less impenetrable veld gets opened up so that more sun reaches the ground. The seed of many Sub- tropical thicket plants require the shade and protection provided by "parent" plants in order to germinate and survive their early growth phase when they are most vulnerable and this opening up of the vegetation reduces germination and survival. However, due to their different feeding habits indigenous browsers Such as kudu, bushbuck and elephant, have the opposite affect. They tend to feed from the top down. This encourages low level growth of the spek boom, which subsequently spreads out. The branches which then come into contact with the soil surface readily take root. These processes help maintain the correct micro climate for seed germination of the other Sub- tropical thicket species. Examples of this veld type can be seen along the road in the Doornkraal - Grasnek area. Fynbos belongs to the Cape Floral Kingdom, the smallest of the world's 7 floral kingdoms and the richest in plant species. 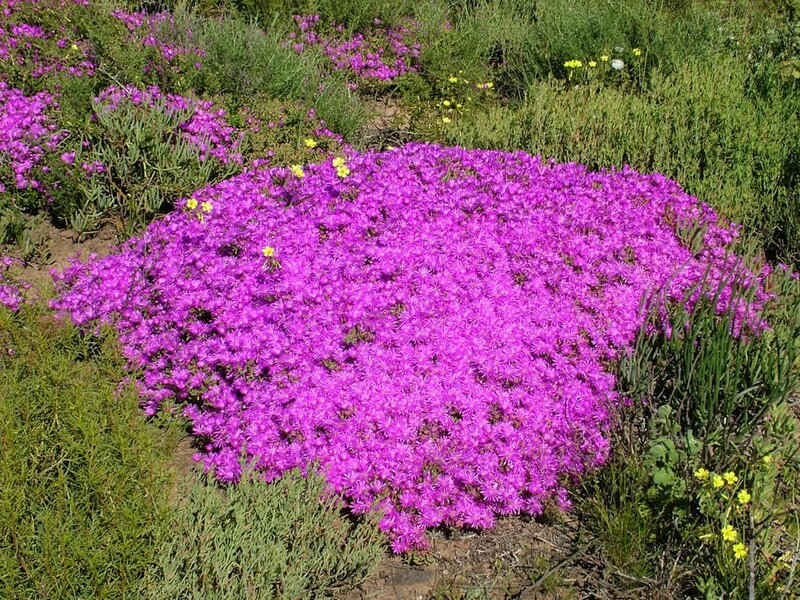 Fynbos is restricted to the winter rainfall region of South Africa and although it dominates the high altitude parts (800m+), the BWA lies on the edge of this veld type's range. 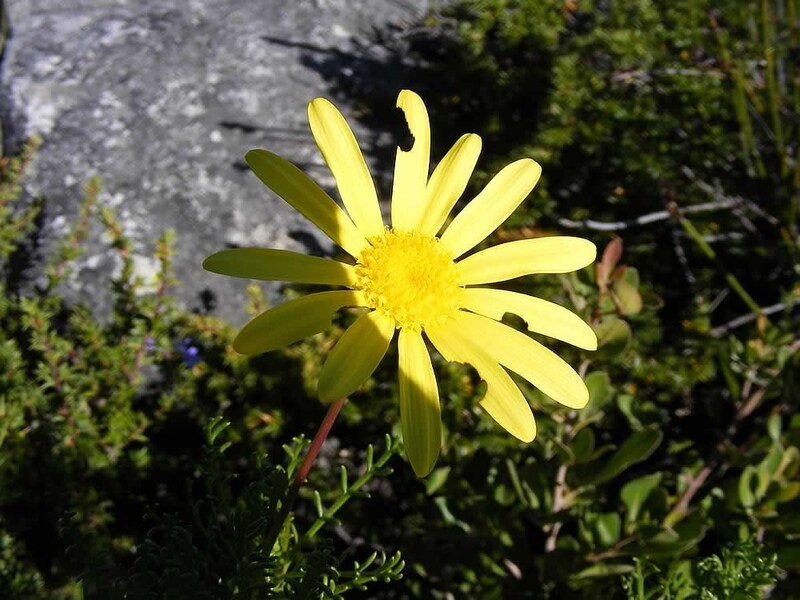 As a result, the number of species found are nowhere near as impressive as those on reserves in the western and southern parts of Fynbos' range. To be precise, the veld type occurring in thc wilderness area is known as Mountain Fynbos. Although experts recognize 3-4 sub divisions of this veld type, they will be treated here as one in order to avoid becoming too technical. 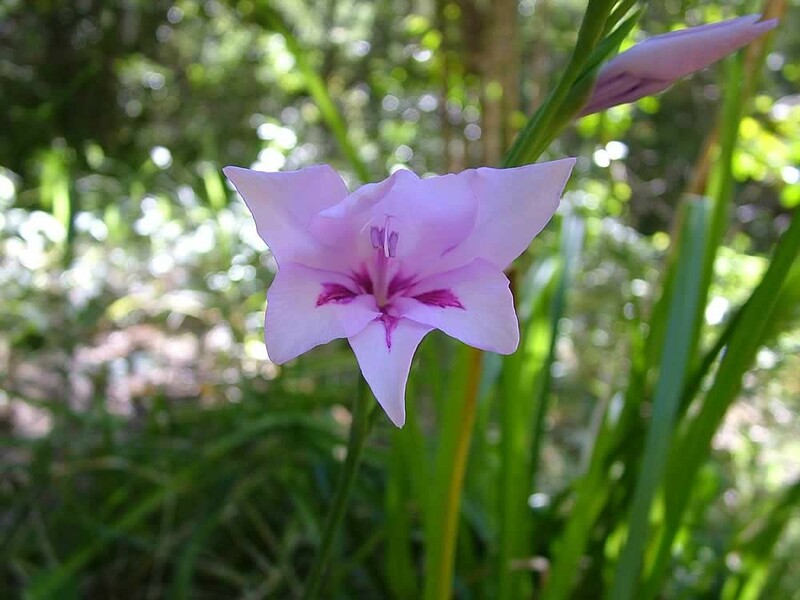 This veld type can be easily recognised by the occurrence of the families Proteacea (33 species). 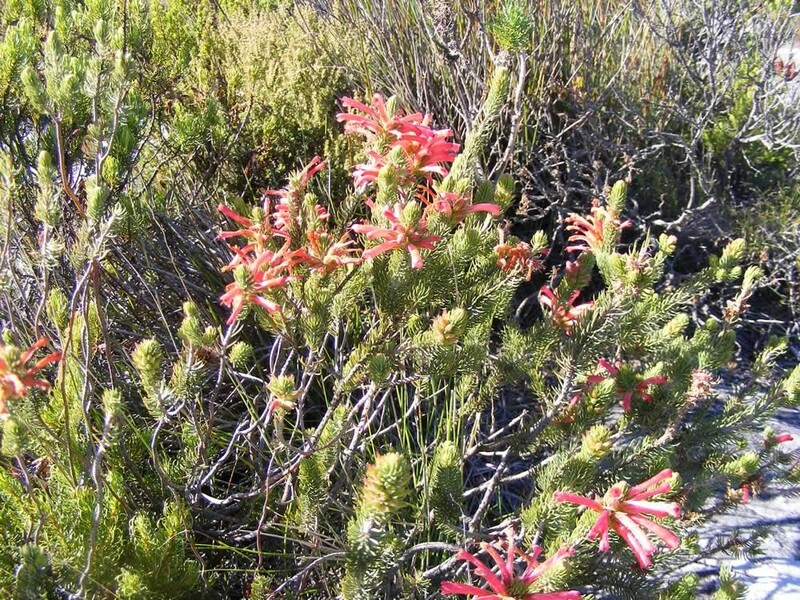 Ericacac, the heathers (52 species) and Restionaceac, the Cape reeds (28 species). Fire is the all- important factor in Fynbos, the crucial elements being the frequency of recurring fires, their intensity and season of burn. 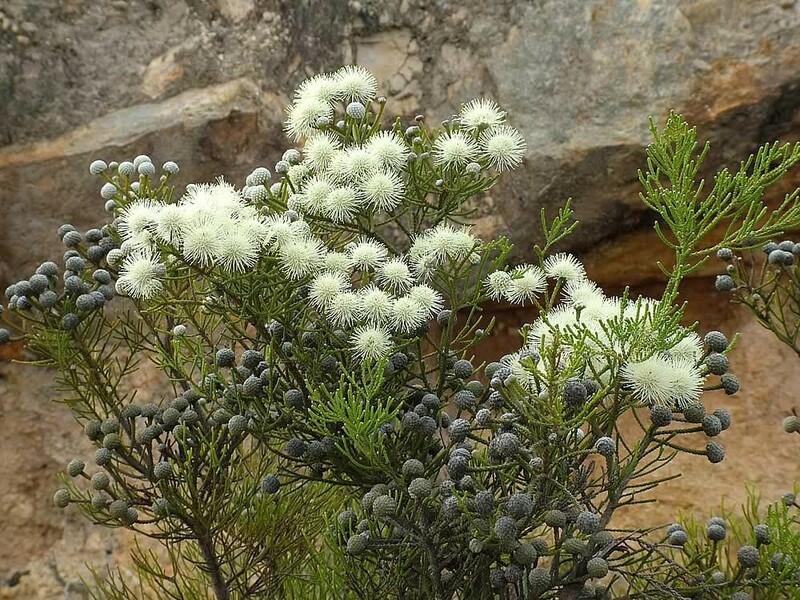 All life in the Fynbos has evolved with, and is adapted to, fire. Plants have evolved a number of ingenious strategies to ensure survival in this fire driven system. Some have a thick, fire resistant bark while others resprout from underground stems bulbs or tubers. Other plants are serotinous and store all their seed in cones throughout their life, releasing them a few days after succumbing to fire. Still others have resorted to myrmechory (ant dispersal), a system in which the seed has an edible attachment called the elaisome. The seeds are dropped in the normal way, however, they are then collected by ants who carry the seeds underground where they are safe from predation from birds and rodents. The ants eat the elaisome and leave the seed which will lie dormant out of harms way until a fire occurs and it can germinate. In contrast to the Sub-tropical thicket, Fynbos has a very low carrying capacity and as a result the only game one is likely to see in this veld type is the klipspringer, although mountain reedbuck. grey rhebuck, red hartebeest, eland and Cape mountain zebra may congregate in an area for a brief period after a fire to feed on the new growth. 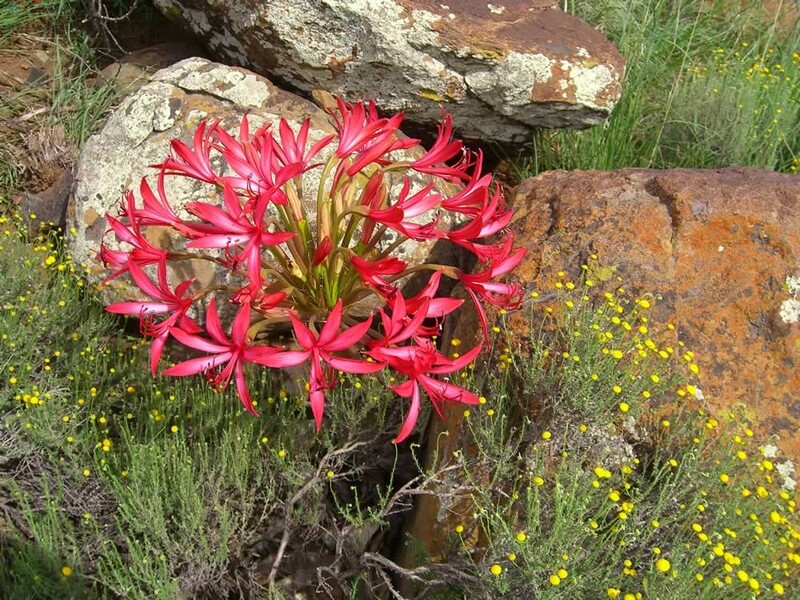 Some Fynbos can be seen from the road near the top of Combrink's Berg Pass, Bergplaas, and the top of Holgat Pass, however, to really experience the Fynbos one would have to hike up into the mountains. Bergplaas is an ideally situated base for this purpose. 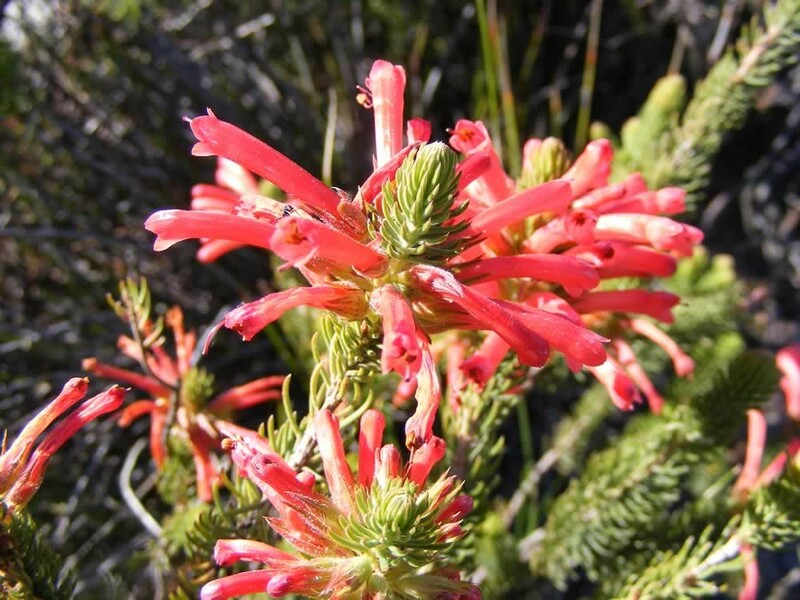 Renosterveld takes its name from the most abundant and conspicuous species in tile veld type, namely renosterbos Elytropappus rhinocerotis, a greyish, small-leaved shrub which usually grows to a height of one meter. Despite it's monotonous grey appearance a wide variety of geophytes occur which tend to flower in spring. The veld type appears to be transitory between Fynbos and the vegetation of the Karoo. It is not a major component of the BWA's flora and occurs mainly in the extreme western areas. Within its former distribution range more than 70% of this veld type has been replaced by agriculture. This vegetation type is found mainly in the western part of the BWA on the lower north facing mountain slopes. Prominent shrubs are the kapokbossie Eriocephalus ericoides, and the asbossie, Pteronia incana. 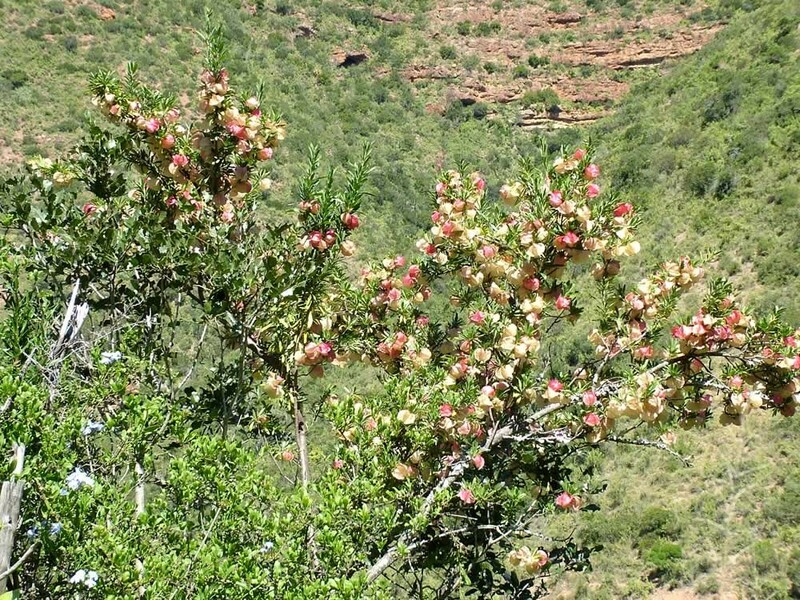 The klapperbos Nymania capensis, with its attractive, inflated fruits, and the wild pomegranate Rhigozum obovatum with it's spectacular, large yellow flowers, are two highly visible indicator shrubs for this veld type.